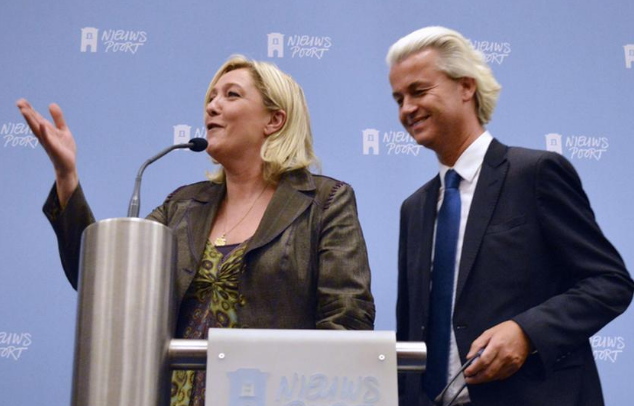 For a second time, Holland is starting the racism trial against controversial PVV leader Mr Geert Wilders (pictured with French rightwing politician and former presidential candidate Ms Marine Le Pen) for his 2014 election speech in which he asked his supporters whether they wanted ‘more or fewer Moroccans’ in the country. The first trial was cancelled after the controversial politician’s lawyer was able to prove the judges were biased against his client. Four years ago, just after Mr Wilders’ nationalist PVV Party had made a first big leap forward, he made a jubilant speech in front of his ecstatic supporters. The Dutch populist told his onlookers he would just ask them three questions. His supporters screamed “less” from the top of their lungs enthusiastically and various human rights groups filed complaints against Mr Wilders. Back in May of this year, during the first trial, Mr Wilders’ lawyer was quickly able to convince the counselors of the court that some of the judges had aroused the appearance of partiality. The Dutch Ministry of Justice therefore removed the judges of the case and rescheduled the appeals trial. Wilders and his lawyer Geert-Jan Knoops complained at the time that the court had rejected their research wishes too easily and therefore seemed biased. The challenge occurred on the first day of the trial and was immediately approved by the Dutch government who feared that Wilders’ populist party would only grow stronger if they allowed biased judges to rule over him. The court originally sentenced the politician in 2016 for racial insults and inciting discrimination against Moroccans, but importantly did not fine him. Tomorrow the political trial against me starts again. An opposition leader to be silenced. As in North Korea. Both Wilders and the Public Prosecution Service appealed against the verdict. The trial is held in the extra-secure courtroom at Schiphol airport as several people have launched death threats against the popular politician. white europe needs a revolution... drag the globalist filth judges and commie lawmakers into the streets for a public hanging.